The European MACUSTAR consortium is conducting a multi-country clinical study on age-related macular degeneration (AMD) coordinated by the University of Bonn. The clinical study focuses on the intermediate stage of the disease, in which a person's vision under low-light and low-contrast conditions is impaired. Throughout Europe, a total of 20 study centers will recruit and follow-up with 750 patients. The study rationale and protocol has recently been published in the journal Opthalmologica. Age-related macular degeneration (AMD) is associated with a progressive loss of photoreceptor cells at the point of sharpest vision. People older than 60 years are most affected, corresponding to around 2.5 million people in the European Union. The number of persons affected by AMD is expected to rise due to increasing life expectancy. Disease progress from an early stage to an intermediate stage is typically associated with low-light and low-contrast vision problems. 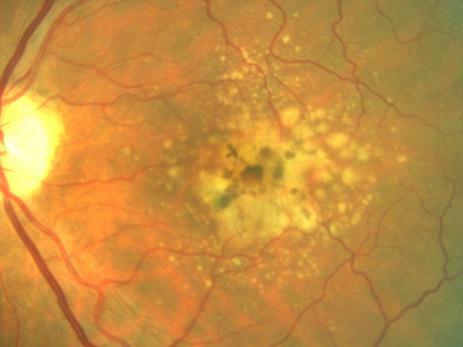 Late stage AMD usually leads to irreversible central vision loss. Publication: Robert P. Finger, Steffen Schmitz-Valckenberg, Matthias Schmid, Gary S. Rubin, Hannah Dunbar, Adnan Tufail, David P. Crabb, Alison Binns, Clara I. Sánchez, Philippe Margaron, Guillaume Normand, Mary Durbin, Ulrich F. O. Luhmann, Parisa Zamiri, José Cunha-Vaz, Friedrich Asmus, Frank G. Holz: Development and clinical validation of functional, structural and patientreported endpoints in intermediate age-related macular degeneration, Ophthalmologica, DOI: 10.1159/000491402. Disclaimer: The contents of this press release reflect the view of the author. Neither the IMI nor the European Union or EFPIA are responsible for any use that may be made of the information contained therein.